Lois Wilson was born June 28, 1894, in Pittsburgh, PA. At a young age, her family movied to Alabama, and she attended Alabama Normal College (the University of West Alabama today) and starting out as a school teacher. She won a beauty contest sponsored by Universal Studios and the Birmingham News and went to California to become an actress. (The pageant is considered to be the predecessor to the Miss Alabama pageant, so, Wilson is credited with being the first Miss Alabama in the Miss American Pageant system.) She started out working for Victor Film Company and later went to Chicago where she encountered film director Lois Weber. When Weber later went to California, she took Wilson with her. 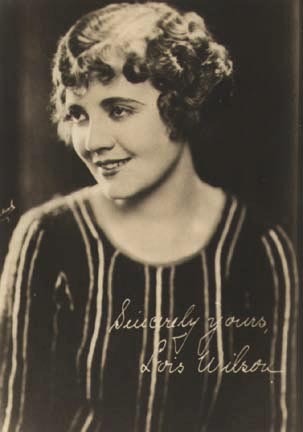 By 1919, Wilson was under contract to Paramount Pictures, her home for the next eight years. She was a WAMPAS Baby Star in 1922. Unlike many silent stars, she did make a successful move to sound movies. She retired from movies in 1941 but did do some Broadway and television work. She had roles in two television soap operas -- "The Guiding Light" and "The Edge of Night." Wilson never married and died of pneumonia in Reno, NV, in 1988 at the age of 93. Wilson appeared in over 80 silent films, as well as several shorts.